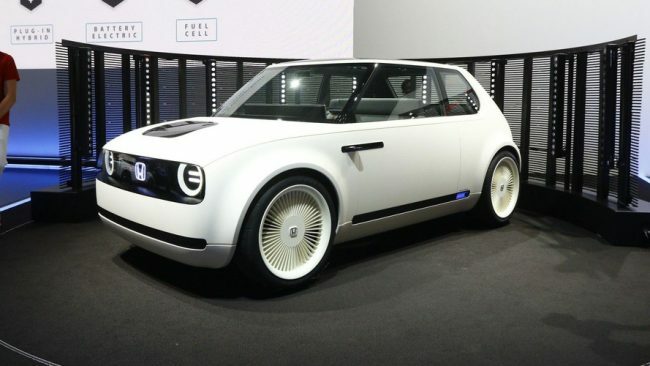 Earlier this year, Honda announced that its cute and small Urban EV concept will result in a production version. The retro-styled 2017 hatchback concept looked fairly minimalistic and unruined by real-world requirements for a production car, so the actual car’s gestation period has been somewhat anxious: What will they keep? What will they leave out? What will the car gain? A test mule has now been spotted doing European testing, and the biggest change we can see is the addition of rear doors. This does not necessarily mean that the car will only be available as a five-door hatchback, but until a three-door model is spotted, it looks like the concept’s attractive, Peugeot 205-style window line has been altered for good. Of course, the 205 was also available with three- and five-door variants, and critics were eager to draw parallels with the iconic French hatch and the Urban EV when the latter was first presented last year, as well as reminiscing about the first Honda Civic generations. However, it seems that the front-opening doors are done for, even if we expect the doors to retain frameless windows. Under the camouflage, we expect the face and rear of the EV to carry a strong resemblance to the concept version. There are LED-rimmed lights in both ends, maintaining the signature look of the concept. Real-world equipment like a rear window wash/wipe have been added, but interestingly, the car will continue with rear-view cameras in place of conventional side mirrors — like the Audi E-Tron. Up front, the hood has been modified into a clamshell-style one, but it retains the likely black-colored bump from the original concept. Inside, the production Urban EV will have a large dashboard screen similar to the show car. So, the commercially available Urban EV is likely to be unveiled at the Geneva Motor Show in March, with production commencing at mid-2019. Honda Motor Europe’s Philip Ross has said orders would start to be taken in early 2019, for markets that will see the Urban EV (sorry, North America). The schedule from concept to production appears commendably quick.